Integrated Pest Management (IPM) is the driving concept behind insect (and other pest) management decisions. Pest management decisions are based on an understanding of the biology of the pest, the environmental impacts of the management options, and the economic damage causes by the pests. IPM is based on the 3 M’s: minimize, monitor, and manage, in that order. We minimize by selecting good cultural practices: resistant varieties, water management, planting date, nutrition, and many others. We then need to monitor our plants, for pests and for general health. Sometimes these monitoring programs are systematic, sometimes they are as simple as walking through your feed and noticing what’s going on. We have developed sampling methods as part of a monitoring program in tobacco. Monitoring also includes correct ID of pests. If you don’t know what you have, you can’t know what do about it! Monitoring (or knowing a pest population density) is also important when using thresholds. Typically, pest populations have to reach a certain density before you start loosing money, and treating before that threshold actually costs more than the good it does. Management options include biological, cultural, and chemical. As a rule chemical control should be our last choice and should be used in a way that causes the fewest additional problems. 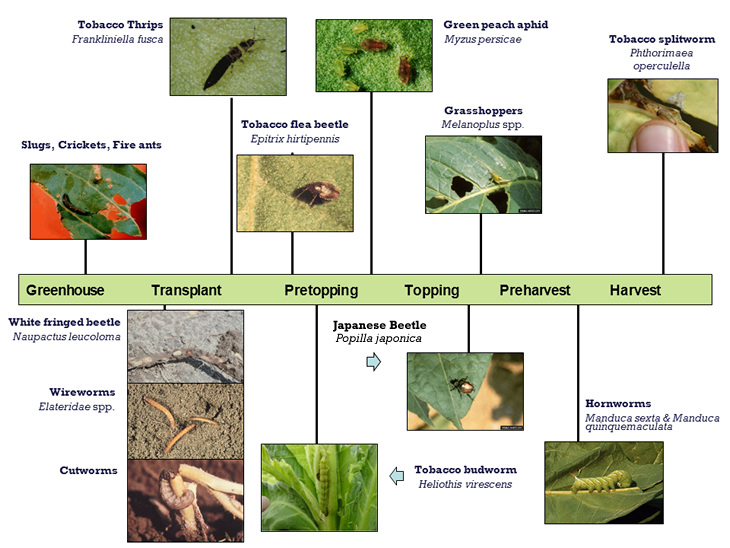 This section describes the key pests in the tobacco agroecosystem, associated thresholds, and management tools. Specific information on registered pesticides, rates, and use recommendations can be found in the North Carolina Agricultural Chemicals Manual.